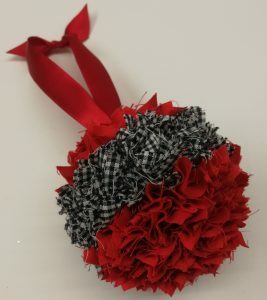 Sy here again and I have been making fabric scrap ornaments for the Unravel & Unwind Christmas window display. How has your week been? Here’s another way you can upgrade your drop-in on Mondays and Thursdays: Get started making your own fabric scrap ornaments! This one is obviously a Christmassy one, using red scraps and some gingham, but you are only limited by your own imagination on this one! Come on down and stash-dive, choose your fabrics and literally Get Stuck In! A Ribbon and a single flat-headed pin, for hanging. It’s really as easy as 1, 2, 3, 4! Cut 1 to 1-and-a-half-inch squares out of your fabric scraps. Pierce a shallow hole in your polystyrene ball with the knitting needle. Put a dab of glue in the hole. Use the knitting needle to push the fabric square into the hole. Repeat this process. When you’re done, pin a ribbon into the top and hang your ornament! What’s On @ Unravel & Unwind?